Primary 7 pupils from our associated primary schools visited Our Lady’s HS on Tuesday 3rd November. This is the first stage of their Primary 7 transition which will be ongoing throughout this year. They took part in a variety of subjects and had a real experience of a day at OLHS. Feedback from the pupils was very positive and they look forward to coming back for 2 days in June. P7 Mass was celebrated by Father Krzystof on Monday 9th June. A large number of parents and P7 and S6 pupils attended as well as Head Teachers and teaching staff from our associated primary schools. Following Mass parents had the opportunity to meet their child’s Principal Teacher of Pupil Support. Click letter to magnify, or click on PDF version at the bottom. The Pupil Support Department are currently working with S1 pupils at tutor time to come up with some advice posters for the new S1 intake as part of the Transition Programme. Pupil Support staff will take a few of our current S1 pupils , along with their posters, to the associated primaries to speak to the new S1 pupils about any concerns they may have and to allow for a question and answer session. 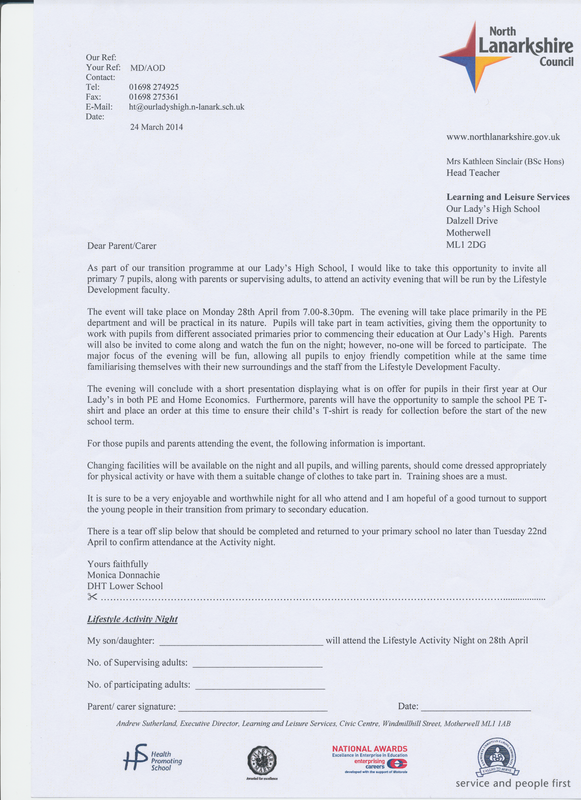 All Primary 7 pupils are invited to bring along parents and carers to an activity evening on Monday 28th April from 7pm – 8.30pm. The focus of the evening is fun, with lots of team activities run by Lifestyle Development Faculty staff. Trainers are essential and changing facilities will be available if required. 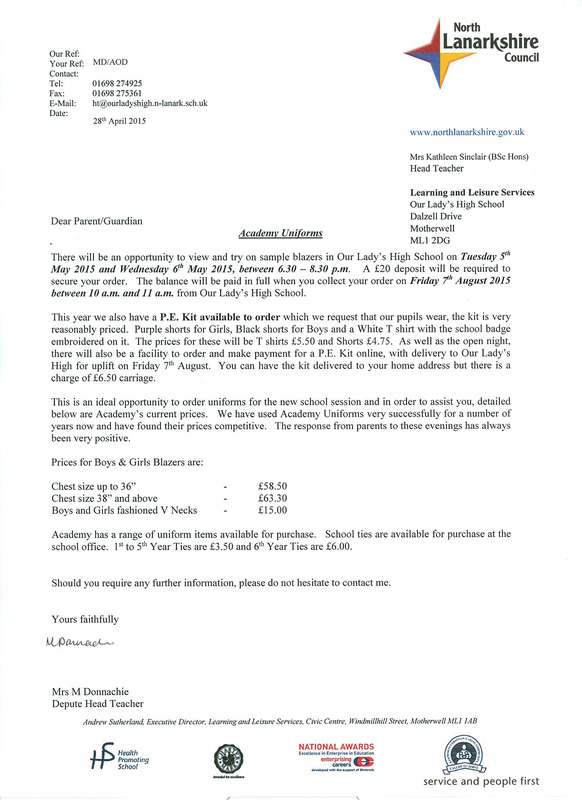 Full details are available in the letter sent home with pupils. Alternatively, click on the image to see full size. Primary 7 pupils from our associated primaries have had a fantastic two day visit to Our Lady’s. Amongst other activities, pupils baked, played drums and glockenspiels, completed quizzes in English and French, used woodwork and science equipment and most importantly, met new staff, their new classmates and their 6th year buddies. Most of Wednesday morning was spent at an inter-house athletics competition before everyone headed back to their schools. Many thanks to all of the staff and pupils who were involved, especially to the 2nd year pupils who acted as escorts throughout: Christopher Cunningham, Nicholas Delaney, Clare Donnelly, Adam Fallon, James Fraser, Andrea Groome, Christopher Kelly, Rebecca McGill, Magen McNulty, Magda Michniewicz, Aidan Nicholls, David O’Hara, Carrie Marie Paton, Scott Rankin, Kirsten Small , Megan Smith and Reece Whitfield. The open evening in Our Lady’s High School is an ideal opportunity for you and your child as well as any other family members and friends to meet staff, view teaching materials, pupil work, demonstrations and tour the school. This is the first event in our liaison programme which prepares your son/daughter for the transfer to secondary. In the course of this session there will be two other occasions when pupils can visit and be involved in school life but parents have told us that the open evening gave them a valuable opportunity to ask questions and to see the school’s facilities. On Monday of this week, everyone started their new timetables, moving up a year and getting a taster of what their lessons will be like for coming back after August. So far, everyone is enjoying their timetables, and, there are hardly any problems! For some reason, pupils seem to be enjoying the lessons most when they get to go down to and watch rehearsals for Grease because their teachers are taking part! Also, on Tuesday and Wednesday this week, Primary 7s from linking schools have been coming up for their Induction days. Many have been enjoying it, and some are nervous, but everyone from other years have been giving them a helping hand, especially the sixth years who have been appointed the jobs of being their buddies. Pupils are also asked that for the rest of the week, and after everyone returns in August, to help the new first years if they need anything. Mr. James Tyrrell visited an S1 assembly at Our Lady’s yesterday to present awards to the winners of the 2010 P7 to S1 Science Quiz. Pupils participated in the contest during the P7 visit to OLHS earlier this year, answering questions on Science and the media, with assistance (but not answers) from 5th and 6th year. Mr. Tyrrell gave a short speech before presenting certificates and winners medals to our top scorers and awarding the Science Quiz P7/S1 Competition Cup to Margaret House. Congratulations to all of the winners and many thanks to Mr Tyrell for his kind sponsorship of the event. All prospective pupils and their families are welcome to come and look around at everything Our Lady’s High School has to offer. Pupils from our associated primaries enjoyed visits to Our Lady’s this week, where they had fun in the Science department. Mixing two clear chemicals, they were startled to see their mixture turning a variety of colours, and tried to work out how it had happened. A warm welcome to all pupils and their families who have come along tonight to Our Lady’s High School. There are exhibitions, displays and activities all over the school, so feel free to explore. You could also look through our blog and website to keep you up to date with what’s going on at the school. If you would like to comment on anything at OLHS tonight, why not leave a comment, by clicking on the “Comments” button above. Our Lady’s is receiving visitors from our associated primary schools on both Tuesday and Wednesday this week, and they are incredibly excited to be here! The pupils are having classes around Our Lady’s, finding out a bit about life in secondary school. In the LRc, for example, the P7s had a look at the blog and the website. All P7 pupils are welcome to leave their thoughts about Our Lady’s here, by clicking on the word, “Comments” above, and filling in the form. Tonight, Our Lady’s is open to all pupils and parents of our associated primaries and any other families considering educating their children at OLHS. There are all kinds of activities taking place tonight in Performing Arts, PE, Technical, Home Economics, Science, Pupil Support, Maths, Modern Languages, English, Social Subjects, Art and the Library Resource Centre. You can also visit our Memorial Chapel and the Cardinal Winning Memorial Lecture Room. Refreshments will be available on the ground floor. We are looking forward to welcoming you to Our Lady’s. Please feel free to come and have a look around. Parents and pupils who took part in the Summer School enjoyed an evening at Our Lady’s, hosted by Partnership Officers, Angela McDonald and Deborah King. 1st and 6th year pupils created and delivered a presentation outlining the activities which took place during the summer school and the benefits gained by those taking part. Parents also viewed an exhibition of photographs and work created during the summer. Each participant was presented with their award certificates by Headteacher, Mr Bernard Love. The K’Nex Cluster Challenge took place on Wednesday morning, 30 April 2008, with pupils from three of our associated primaries taking part. Pupils competed in pairs to build a miniature beach buggy. The winners were	Heather Baird and Aimee Brennan from St. Bernadette’s Primary School. Many congratulations to both of them. Runners-up	were Harry Reynolds and Christopher McCluskey (St. Bernadette’s PS), Jordan Mooney and Stephen Murphy (St Bernadette’s PS) and David Martin and Keira Winton (Cathedral PS). All of these pupils will participate in the K’Nex Area Challenge on Thursday 29 May 2008.